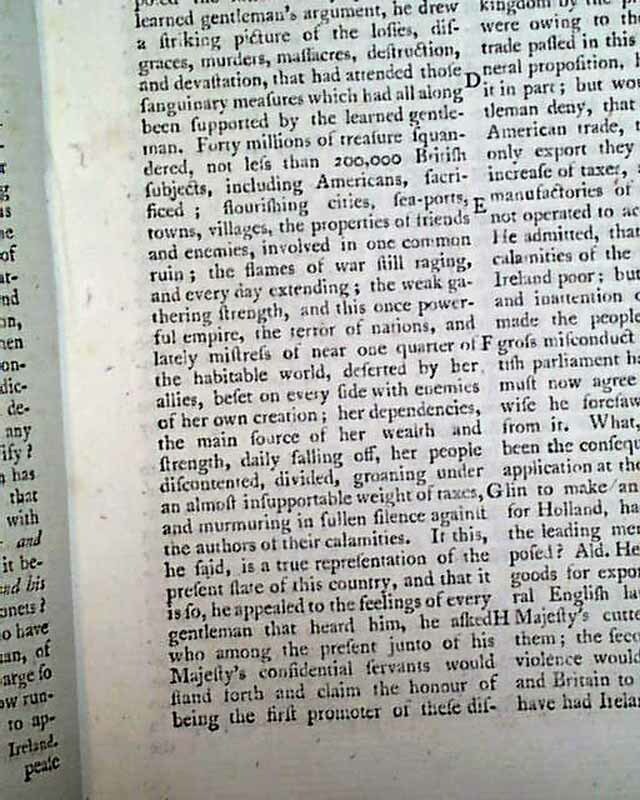 The first article has "Summary of Proceedings in the Present Parliament" which includes discussion of the situation in America. 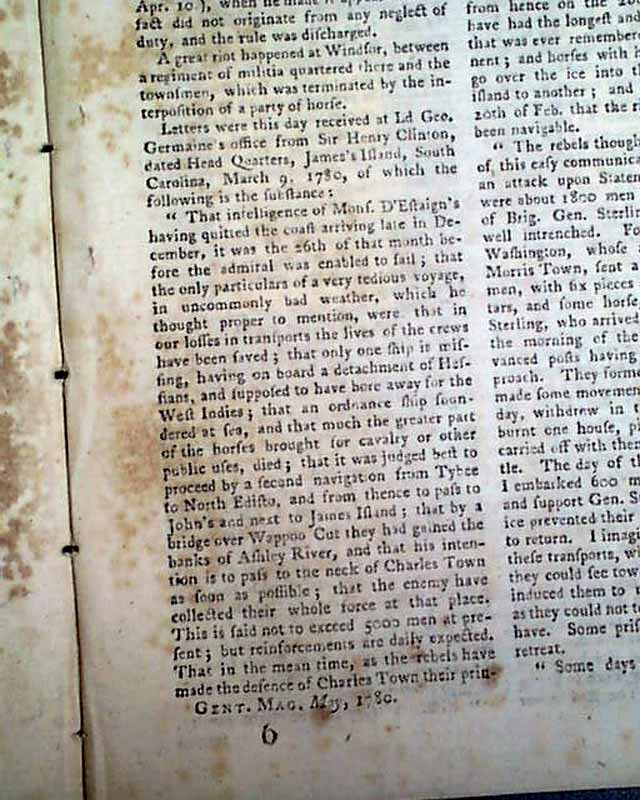 Near the back the "Historical Chronicle" has several items from America concerning the Revolutionary War, including a letter from New York which has: "...since Gen. Clinton's departure from hence...the longest & most severe winter that was ever remembered...horses with heavy carriages could go over the ice into the Jerseys...The rebels though to avail themselves of this easy communication & threaten an attack upon Staten Island...For this purpose Gen. Washington, whose army was hutted at Morris Town, sent a detachment of 2700 men with six pieces of cannon...They formed the line...withdrew in the night after having burnt one house, pillaged some others..." with more on this military encounter (see). 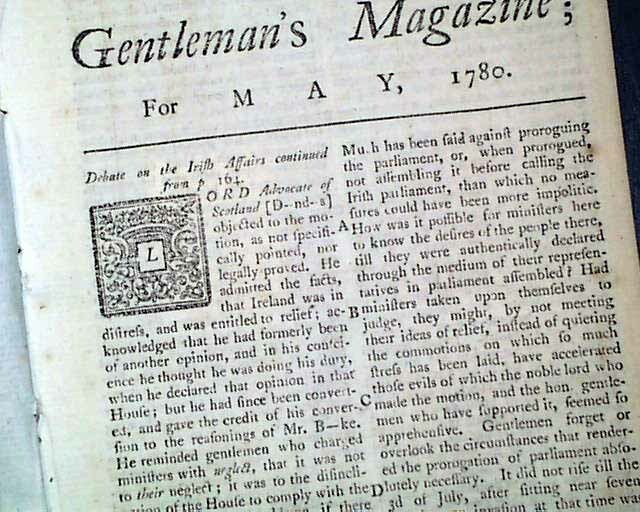 Another letter is from Sir Henry Clinton at James's Island, South Carolina tells of military events there including: "...that their long voyage & unavoidable delays since had given the rebels time to fortify Charles Town...he still entertained great hopes of success...rebels have made the defence of Charles Town their principal object." 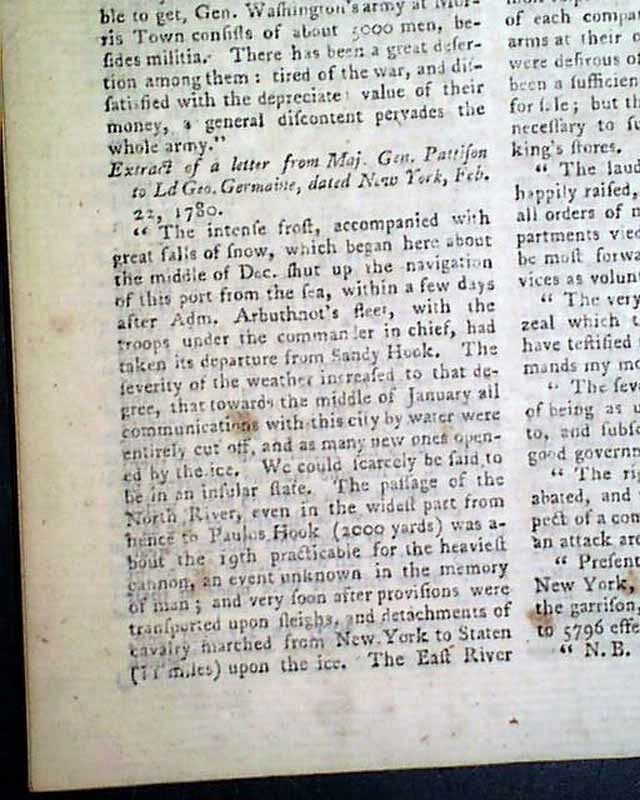 Plus there is another letter from Major General Pattison to Lord George Germaine from New York which includes talk of the terrible winter: "...detachments of cavalry marched from New York to Staten (11 miles) upon the ice. The East River to Brooklyn on Long Island was also, for many days, blocked up. 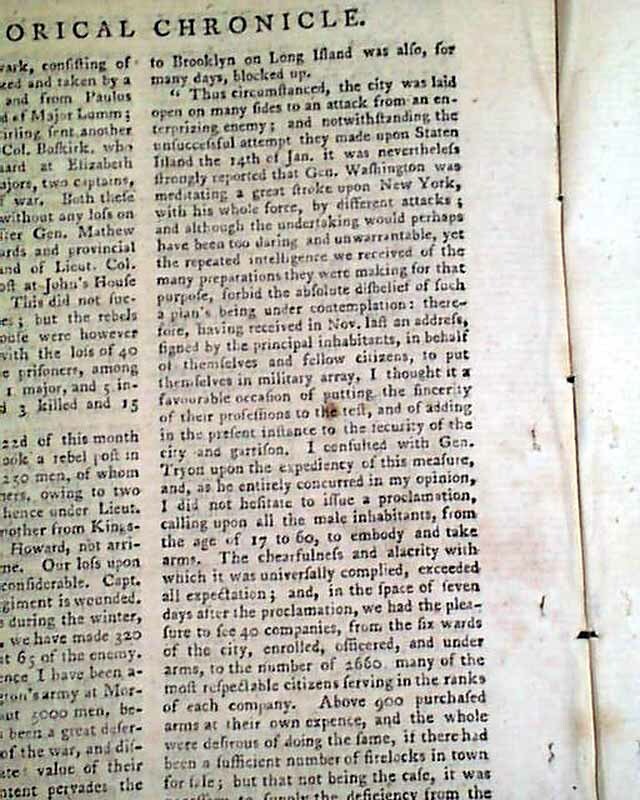 Thus circumstanced, the city was laid open on many sides to an attack from an enterprising enemy...it was nevertheless strongly reported that Gen. Washington was meditating a great stroke upon New York with his whole force by different attacks..." and much more (see). 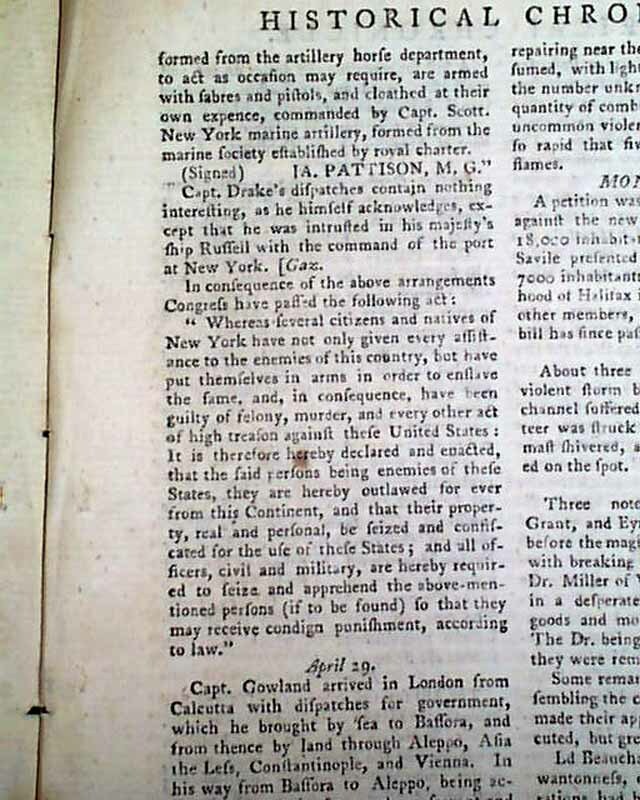 Included also is an act from Congress concerning New Yorkers who have given assistance to the British: "...said persons being enemies of these States, they are hereby outlawed for ever from this Continent & that their property real & personal be seized & confiscated for the use of these States..." (see). 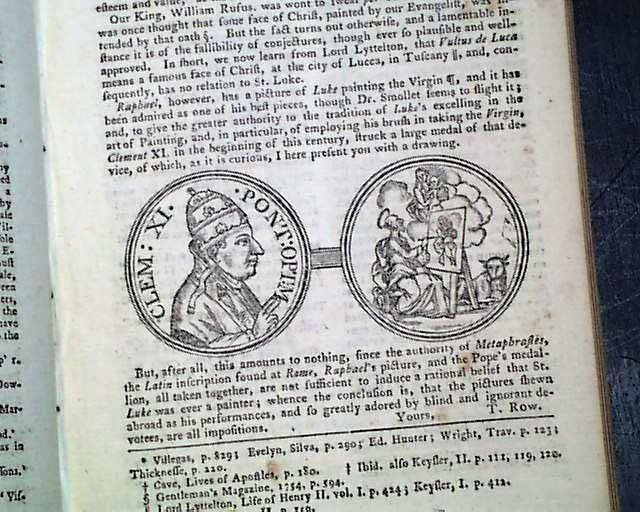 Other items include "An Historical Account of the Virgin Islands in the West Indies..." "New Experiments in Agriculture" "On the Constitution of the Human Body" and more. Lacking the one plate called for which was of no relevance to any mentioned articles. 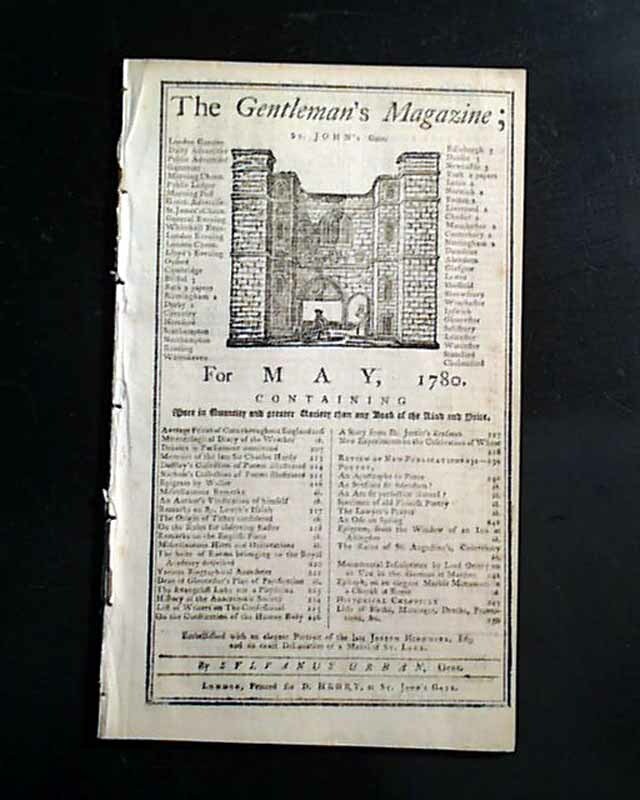 Complete in 48 pages with full title/contents page featuring an engraving of St. John's Gate, 5 by 8 1/4 inches. Very good condition.